It is culturally fascinating with strong links to Tibet in the upper Buri Gandaki (called Nupri ‘the western mountains’) and the Tsum Valley, and even includes the Larkya La (5106 m) as a challenge. The views of Mt Manaslu, the eighth highest mountain in the world, are marvelous and spellbinding. The trek around Manaslu circuit and Larky pass can be done more conveniently these days because there are several lodges available all along the route. There are even phone and mobile access in some parts of the trekking trail. Nearly every village now has a proper lodge. You can certainly find porridge, tsampa, noodles, omelets and roti at most places. While simple, they are clean for the most part. There are also small shops in most villages along the way with limited stocks of soap, toilet paper, batteries, bottled water, biscuits, noodles, beer, whisky etc. Among the trips to Nepal, this is the absolute highlight, with strong, friendly, hospitable people, a living Buddhist culture and untouched wildlife because of Buddhist prohibitions on hunting.The people are poor, since they have been bypassed by development for centuries, but this means their unique culture has remained intact. While many of the famous treks do not have strict requirements, some restricted treks need a minimum of 2 trekkers and licensed guides to accompany the trekkers as manaslu trekking same rule in Nepal trekking. You will be provided the permit only after fulfilling these requirements. The cost of a guide or a porter is around $20 to 27$ which also covers the accommodation, salary, food, insurance, trekking gear and guide bag for the guide. If you would prefer a porter instead of a guide, it would cost between $15-$18 including the accommodation, food, salary and insurance. head upstream along the Budhi Gandaki. We then descend to the wide, sandy riverbed and then continue along a winding mountain path overlooking the river. As the elevation increases, the scenery undergoes a complete transformation, with white sandy areas along the riverside. great views of the Sringi Himal. We then drop down to the river, cross a long suspension bridge and climb up to Philim. In the afternoon, we’ll explore the village and the surrounding hills. Today we will scramble steeply up into a spectacular trail before descending to cross the river. In the afternoon, we take a side excursion to the small settlement of Prok – a two hour round trip. view of Peak 29 ahead. You can take a side excursion to Pungen Glacier in order to get a close up view of Manaslu from here. The trial follows a lateral moraine of Pungen Glacier towards Sama. It takes a further 20 minutes to reach Sama Gompa for our night halt. full day walk is towards Manaslu Base Camp (approximately 6-7 hour round trip). Alternatively, there are half day walks either to the glacier across the valley or to Birendra Tal. views of the mountains, especially Manaslu, are ahead of us as we reach Samdo, a Tibetan refugee village. This remote village is only a day’s walk from the Tibetan border. In the afternoon, we will explore the village and surrounding hills. from trade with Tibet years ago. After a steady climb we will arrive at our lodge at 4450m at Dharmashala. Leaving Dharmasala behind, we will gradually climb towards glacier moraines that offers excellent views of nearby Larka Peak and surrounding peaks and valleys. Eventually, we make our way through steep terrain and arrive at the highest point of our trek – the Larkya La Pass (5106 m). From this high pass, never seen before view of Annapurna 2, Cheu Himal, Himlung Himal and other surrounding peaks are visible with Manasalu Himal right in front of us. We stay overnight at Bimthang. We will walk south below Bimthang behind the moraine wall for some time before crossing the Bhimtang Glacier. We will climb up the far moraine wall quickly to avoid stone-fall and enter some of the best forests in Nepal. With the gentle riverside walking to Karche (2700m) we take lunch after about 3.5hrs. In the next hour we will see many signs of a glacial flood, with tree trunks smashed and banks undermined – the track becoming quite rough. We will climb steeply over a ridge and drop to Gurung Goa (2560m), the first real village since Samdo. Then we will go towards Dharapani (1860m) and we will rest in one of the hotels at Dharapani. We will come back to Kathmandu in a jeep via Besi Sahar as we enjoy the beautiful scenery of rice fields, terraced farms, rivers and valleys and refreshing views of the hilly areas and mountains. After a few hours’ journey we reach Kathmandu where we will spend the last night in Nepal. Breakfast, Lunch And Farewell Dinner. 2 nights room in peace, clean and standard hotels in Kathmandu, B&B service. Well experienced, government registered, fluent English speaking and friendly guide and Porters . Group first aid kit and water purifiers. Food, accommodation salary of the guide & porters. 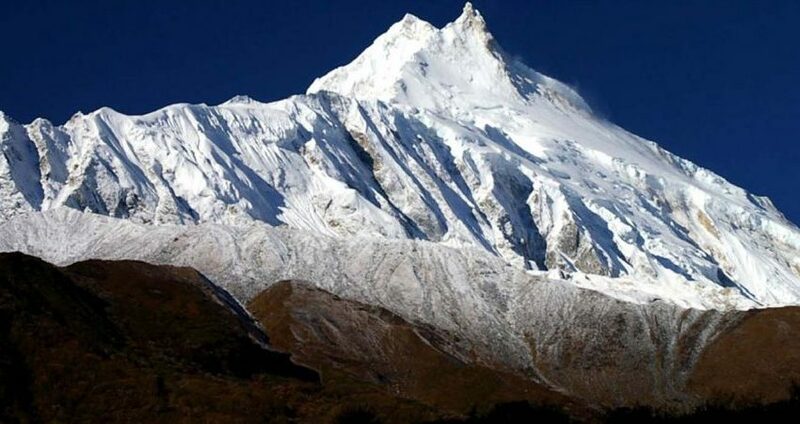 Manaslu special Trekking permit and MCAP permit. Nepal Planet Treks and Expedition Office service charge, government tax and vat etc. Insurance and trekking gear for guide and porters. Laundry service, toiletries and personal nature expenses. Personal insurance, Nepal visa fee, international air ticket. Rescue operation charge in case of emergency and laundry services.